In the western part of Bukhara, close to Samanid mausoleum and Chashma-Ayub Mausolem there is one of the most beautiful and graceful ensembles –Kosh-Madrassah. There are two madrassahs, built in the XVI century, in traditions of Bukharan architecture. And the name “kosh” is translated as “double”. First one was the Modari-khan Madrassah, built in 1566-1567. in translation from Persian it means “the mother of khan” – the ruler of Bukhara Abulla-khan built it in honor of his mother. The construction of educational institution is performed by standards of that time: classrooms (darshona) are located in the head of the building, rooms of dormitory – in each flank and in the facade, and the mosque – in the tail. The facade is finished by bright and many-colored mosaic. The second madrassah was built a quarter of a century later, in 1588-1590, and was name in honor of Abulla-khan. The main entrance is the high portal, flanked by wings of the building with two floors of loggias, decorated by different patterns. In design of the building masters used the majolica tiles, which plays in the sun with blue and green colors. At the distance from Abdulla-khan Madrassah its facing is not so clear, but on account of blur it obtains its original brightness and attractiveness. It seems that it consists of sky, clouds and sand of desert. 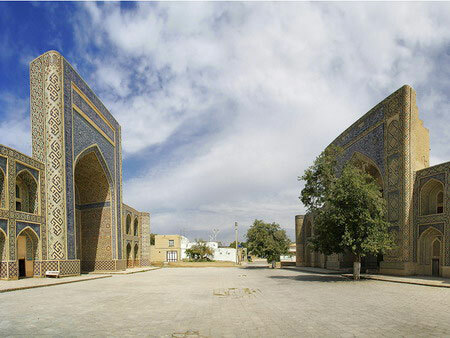 In addition, Abulla-khan Madrassah is one of the largest in Bukhara. The complex Kosh-Madrassah, locating in some distance from the central accumulation of various mosques and madrassah, greatly stands out in Bukharan architecture. And mosaic, perfectly preserved on the walls of the madrassah, attracts by its harmony and gracefulness.